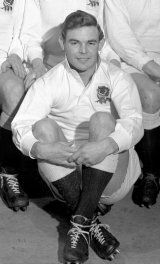 A well-built, quick and strong scrum-half for Old Millhillians and Middlesex, Johnny Williams won the first of his nine England caps against France in the last Five Nations game of 1954, retaining his place throughout the following season despite the England side disappointing until the last game. He was one of three scrum-halves taken to South Africa with the British Lions that summer although he failed to play in any of the Tests, the Times noting he started the tour poorly but finished strongly. In the eight games he appeared in he scored five tries. Williams replaced Dickie Jeeps, who play in all four Tests and made his England debut in the opening game of the 1955 Five Nations and held on to his place for the remainder of the competition. He lost his place at the end of the season but continued to impress for club and county. In 1965, nine years after his last cap, he was recalled by England against Wales but "the weather and relentless Father Time" were against him and he was quietly dropped for a final time. He died in 2009 after a long battle with Alzheimer's. Jeeps said, "John was a superb scrum half and represented his club, county and country with distinction."